Santorini and Amorgos are two islands of great beauty, and combining a visit to both during your summer holidays would be an excellent choice and a real delight! The Santorini - Amorgos ferry route is operated by direct ferries only during the summer months with itineraries at least once a day. The islands are in close distance to each other so the ferry trip from Santorini to Amorgos is a bit more than 1 hour with a high speed ferry. The ferry ticket prices depend on the type of vessel that you choose to travel with while both the ferry itineraries and the prices are subject to change every year. Indicatively and based on 2019 data, the ferry trip from Santorini to Amorgos with a high speed ferry costs approximately 50€ for a standard economy ticket and with a conventional ferry it costs around 13€. Search Ferryhopper for all the available ferry schedules from Santorini to Amorgos and book your ferry tickets to enjoy the crystal blue waters of the Cyclades! How long is the ferry trip from Santorini to Amorgos? The distance between Santorini and Amorgos is approximately 76 km (47 miles) so the ferry trip can be relatively short, depending on the type of ferry that you travel with. Usually the Santorini - Amorgos route is operated by high speed ferries which take approximately 1 hour and 10 minutes. Once a week there is also the option to travel from Santorini to Amorgos with the legendary ‘Express Skopelitis’, which is a conventional ferry that takes a bit less than 5 hours to reach Amorgos. The ferries that depart from Santorini to Amorgos usually arrive to the port of Katapola, which is located in the south-west of the island. The port of Katapola is 15 minutes drive from the Chora of Amorgos and 40 minutes drive from the port of Aegiali in the north of the island. Amorgos is an island of great beauty, famous for its local cuisine, its magnificent views to the Aegean, its picturesque villages and of course its crystal blue waters. We highly recommend travelling from Santorini to Amorgos as you can enjoy the attractions of both these beautiful islands. Summer season - direct options: During the summer months, ferries depart daily from Santorini to Amorgos, usually once a day. Once a week the ferry route is also served by ‘Express Skopelitis’, which might take longer to take you to Amorgos but it’s a ferry ride that every island-hopper needs to do in their life! 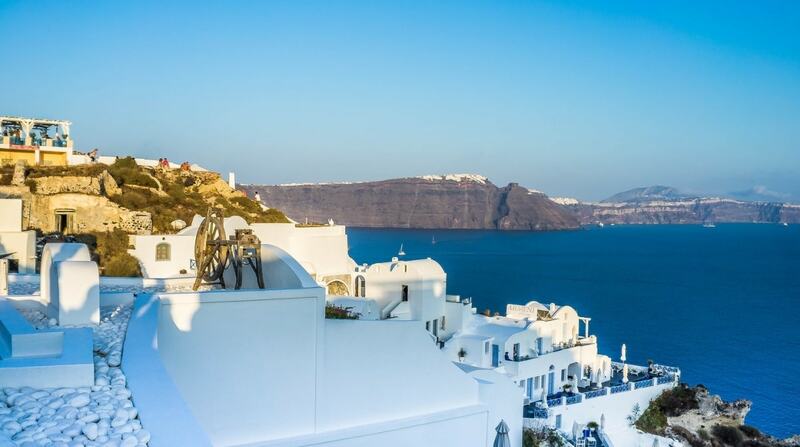 Summer season - indirect options: If you have some time for island-hopping in the Aegean then you can choose a more adventurous option to go from Santorini to Amorgos. The port of Santorini is well-connected to the islands of Naxos, Paros or Mykonos and from there you can take a ferry to Amorgos (Katapola or Aegiali). Winter season - indirect options: During low season there is no direct ferry connection between Santorini and Amorgos however it is quite easy to travel to Amorgos via Naxos or Paros. Search on ferryhopper for all the direct and indirect ferry routes to the Cyclades and find the itineraries that best suit your summer holiday plans! The port of Santorini can be extra-busy during the summer months and many ferries and cruise ships might be departing or arriving in the same day. We would therefore recommend that you arrive to the port of Santorini at least 50 minutes in advance of your trip and also calculate the possible traffic. If you have any question about your ferry you can ask the port authorities. Find many useful information about the port of Santorini in our blog post ‘Athinios port in Santorini: A Survival Guide’. When travelling in the Aegean seas you should be aware that it often gets windy and the ferry rides can be bumpy. The distance between Santorini and Amorgos is quite short but if you get sea sickness do not worry at all! You can ask the ferry crew to provide you with an aspirin or an anti-nausea tablet. If you would like to travel from Santorini to Amorgos with your car or motorbike keep in mind that most of the high speed vessels that serve this ferry route do not have a garage and therefore you cannot transport your vehicle. If you wish to visit the Greek islands and the Cyclades in particular during high season make sure that you book your ferry tickets well in advance (2 to 3 months). Santorini and Amorgos are very popular holiday destinations and ferry tickets might sell out fast! Amorgos is also a great gateway to the Small Cyclades as from the island depart ferries to Koufonisia, Donousa, Irakleia or Schoinoussa. Search ferryhopper for all the ferry connections from Amorgos to the islands of the Cyclades and start your holidays as soon as possible!